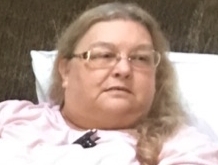 Portland, ME – Rhonda L. (Wilbur) Cheek, 60, of Westbrook passed away on Saturday, September 29, 2018 at Mercy Hospital. She was the wife of the late Wally Cheek Jr., who died just eight months ago. She was born in South Portland, ME on October 25, 1957, she was a daughter of proud Irish descendants, the late Ronald L. and Marilyn (Denbow) Wilbur. Rhonda was home taught, going on to receive several college credits. She worked in landscaping and was a property and engineer manager in the Jacksonville Beaches area for many years. Rhonda enjoyed being a wife and caring, cooking and baking for her husband, Wally. She was a detailed and humorous story teller and was passionate about the Jacksonville Parks and Beaches. She also enjoyed bike riding, camping and all the wildlife that came with it. She is survived by two sisters-in-law, Beth A. Damian and her husband Victor of Westbrook, ME and Ruth Leathers and her husband Jody of Sangerville, ME as well as Ruth’s children April Noble of Rector, AR, Sally Decker of Sangerville, ME and Sandy Hoitsma and her husband Mike of Vilonia, AR. May God hold you in the palm of Her hand. There will be no formal funeral services, Rhonda would want to be remembered lovingly at your own will and on your own time. Loved always and forever. In lieu of flowers or donations, spread kindness and compassion to all things and open your heart to what is and what can be.